TIA has done a sensational job in helping to educate the tire industry by providing training and educational materials regarding proper TPMS service, but the majority of consumers still lack the knowledge of TPMS and the safety benefits it provides. Exceptional knowledge at the service counter not only helps to determine a customer’s needs, it also helps to educate those customers unfamiliar with TPMS. After all, how many drivers actually read the owner’s manual tucked away in the glove box? Since the passing of the TREAD Act in 2000, in an effort to reduce tire-related problems and accidents due to underinflation, TPMS became mandatory for all light motor vehicles sold in the U.S. after Sept. 1, 2007.TIA has done a sensational job in helping to educate the tire industry by providing training and educational materials regarding proper TPMS service. TIA offers training kits that can be purchased online, as well as TPMS-related charts and manuals to make servicing and customer education easier. But with all of TIA’s effort to help the tire service industry, the majority of consumers still lack the knowledge of TPMS and the safety benefits it provides. There are many options available that are helping to drive down the hardware cost for direct TPMS. As TPMS continues to mature, the pricing is expected to head down due to progression in manufacturing technology and market saturation. But not all sensors are equal. Pfeif­fer explains, “The aftermarket sensors have worked well for domestic vehicles that we service, but we turn to OE sensors for the import vehicles. Roughly 35% of the aftermarket sensors installed on BMW and Mercedes vehicles by our shop were coming back for TPMS malfunctions. Eliminating comebacks is important in satisfying the customer and proving that your shop is up to speed when dealing with TPMS. It’s bad enough that the customer gets hit with additional costs, and comebacks only add insult to injury. Another more common reason for valve core seizure is the use of brass cores instead of nickel-plated versions. Even with the use of sealing valve caps, brass cores will seize inside the aluminum TPMS clamp-in valve because of galvanic corrosion, a condition when dissimilar metals fail to coexist. 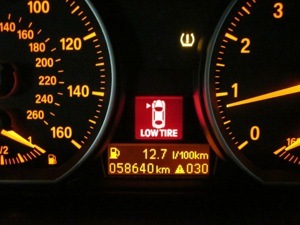 The intent of the TPMS part of the TREAD Act is to prevent underinflated tire conditions. Yet because of the cost to repair direct TPMS sensors, vehicle owners sometimes choose to ignore the warning light in the dashboard. This unintended consequence basically renders the TPMS ineffective. Letting the customer drive off with an inoperative system does not violate the Motor Vehicle Safety Act, since the system was presented to the service shop as inoperative. Again, this practice does not violate the “make inoperative” provision, since the vehicle was documented to have an inoperative sensor prior to TPMS service. 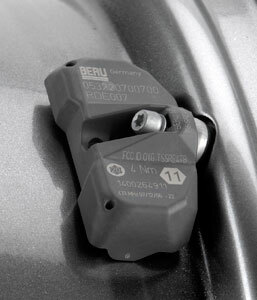 With the proliferation of rubber snap-in valves used with direct TPMS sensors as a lower cost alternative to clamp-in TPMS valves at the OE level, confusion as to whether or not an assembly has a sensor can occur. Al­though snap-in TPMS valves have the distinguishing long shoulder and extended valve cap, there are chances for error to the un­trained eye. Pfeiffer says, “Proper training can prevent mis­haps; we train all of our techs to treat every tire as if it has a direct TPMS sensor.” The valve companies are working on introducing other means to make the snap-in TPMS valves more distinguishable, especially in poorly lit shop environments. In light of service issues that surround direct TPMS, indirect TPMS may have the advantage. Car manufacturers such as Volkswagen and Audi have turned to indirect TPMS. Indirect systems rely on increased tire deflection from an underinflated condition in order to trigger a warning at the dashboard. Indirect systems utilize the ABS wheel speed sensors to electronically compare wheel speed with vehicle speed. For this reason, vehicles delivered with runflat tires utilize direct TPMS, since runflat tires have less deflection in underinflated conditions compared to conventional tires. Indirect TPMS also allows for easy changeover of dedicated winter and dedicated summer wheels and tires, since the wheels do not require pressure sensors. Educated consumers are learning the issues of TPMS and are sometimes choosing to purchase vehicles with indirect TPMS in order to avoid future headaches and expense. Regardless, TPMS reduces the incidence of underinflated tires on the road, and proper training in servicing these systems will continue to make our highways safer. 1) Place the rim on the mounting table with the curb side of the rim face-up and secure the rim clamps. Next, move the sensor to the 5 o’clock position. See photo in step 4 to verify sensor position. 2) Apply lubricant to the bead area of rim, but do not apply any lubricant to the sensor and its surrounding area. Then apply lubricant to the tire bead areas. 3) Place the tire on the rim, making sure that directional tires are mounted in the appropriate direction. 4) Then, place the tire mounting head securely to rim at the 12 o’clock position and slide the inner tire bead partly over the lip of the rim. 5) Using a tire tool, lift the inner tire bead up and place it partly on the mounting head. Then, while rotating the table, manually assist the tire until the lower bead is completely positioned. 6) Now, rotate the mounting table so that the sensor is once again in the 5 o’clock position. Using the tire tool, lift the outer tire bead partly on the mounting head and while rotating the table, manually assist the tire until the outer tire bead is positioned. 7) To inflate the tire, first remove the valve cap and core. Keep these in a safe, easy to find place. Next, inflate the tire up to a maximum of 40-50 psi or 3.5 bar to seat the tire beads. Two popping sounds indicate that both tire beads have been seated. Re-install the original valve core, if clean, then adjust the tire pressure to the vehicle’s recommended placard pressure, and re-install and tighten the valve cap. The tire is now ready to be mounted on the vehicle.